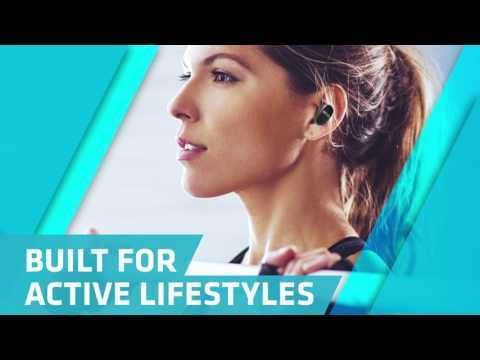 Streamlined Bluetooth headphones that won’t get in the way of your training. The Earcanz compact earphones bring big sound from a small package, whether you're listening to music or taking calls. The efficient internal battery provides up to 3 hours of playback or talk time on a single charge. Both earphones have a single multi-function button that controls your music or answers calls, so your phone can stay in your bag. Three different sizes of ear pads and ear wings let you dial in a precise fit, and your earphones stay anchored in place during vigorous workouts. Up to 3 hours of music or talk time on a single charge. Easy micro-USB charging means you can top up your battery almost anywhere. Integrated button lets you answer calls and control your music. Lightweight design lets you focus on your workout, not your headphones. 3 different sizes of ear pads and ear fins let you find the perfect fit. In the box: Earcanz TRU, micro USB charging Y-cable, ear tips in 3 sizes, ear fins in 3 sizes, ear hooks, travel case and 808 decal.